I met up with an amazing artist on Periscope recently – Karen Orr. She’s a bridal illustrator (her Website, Instagram, Periscope) and taught me this secret weapon. She uses it for sheer and satiny fabrics, but I saw the application possibilities immediately! When coloring with Copics, often it’s complicated to figure out how to make glass look like glass – as if that glass is in FRONT of the images we’re coloring. Not all colorists worry about such details, but for me – it always bugged me that I could make the glass “behind” the contents of a glass jar look glassy, but never quite worked out the front pane of glass. Well with a special Secret Weapon – I’m bugged no more! (Scroll down in this post to see more about how to create some of the glass pieces!) Watch the video below or click HERE to see it in HD on YouTube. I know some folks will be frustrated that I didn’t show how the images were colored with Copics, or show the masking; below in these graphics, I tell you how I did the masking at least. But I have a deal for ya: if there’s a cry for a tutorial on one of these, I’ll try to work it into the schedule in the next month or two, ok? Whatever gets pinned the most. Have at it and vote for your favorites! I was a little blown away to suddenly notice yesterday that my YouTube channel now has over 40,000 subscribers! Holy guacamole! It was only one year ago (Feb 2015) that the 10,000 threshhold was crossed – so this has been one crazy amazing year. I’m humbled that THAT many people clicked the little red button! To qualify, leave a comment with your favorite charity, and I’ll pick 10 commenters’ favorites to send a chunk of the money to….and I am SO EXCITED. I’ve done this for previous giveaways, and oh man. The day I get to go online and hand out money to good causes that I get to learn about??? #bestdayever! It’s like mad money that makes your heart burst with joy! Hello again Sandy, I love to do painting, pastels, watercolor, oils acrylics, and just drawing. I have been into art of any kind since I was about 3 yrs old when my mother sit me down with finger paints. I was hooked. I painted a master piece “blob” that was mostly brown, but she kept it in her treasures for all her life. I told her it was our dog. She journaled the story on the back, and praised my determenation. Watching you do your beautiful art work is a privaledge and I find myself neglecting my home duties. But your tutorials are the best because as you do your explanation of the process I get so inspired to do my own work. I sometimes watch them over several times so I can get a total understanding. I got away from my art for a few years, and everyone I know has tried to get me back to it. I think you finally did it. Thank you so much. My best critic was my dear husband but I lost him to cancer, thus the reason I got away from my art. So my favorite charity is Hospice of America. They were so good to us, I can never return that kind of strength and kindness, that they shared in his last days. Thank you again for all you inspiration, and what ever your choice in charities, I know will be a welcomed event. I have started Bible Jounaling, and I’m so happy to spend my time with God. He has blessed me beyond measure, and I’m a happy person for it. You get the credit for getting me hooked on that art too. God bless your hands, heart, and mind, and have a blessed weekend. I love watching you paint and craft. You are such a good teacher. I love the glass look technique. My favorite is the Fairy Terrarium.Congratulations on the 40+ subscribers !!!!!!!!!!! My favorite charity is Pets Inc. adoption center. Hello and very cool blog post. Glass is always hard to try and I’m sure that’s why a lot of people don’t. I know I don’t. I’ve been stalking your blog for a while now and enjoy your way of teaching, your way of putting things as they are. Some of us tend to sugar coat things in order not to hurt feelings and a lot of times the true word and meanings get lost. Anyway I’m not sure if this contest is over I got excited and ran to the comments part. I don’t enter too many giveaways but occasionally I will. This one is one is love to win as its fresh on my mind today. I so wish I could hit the lottery or something like that and help as many animals as I could. So I would love it if I won for it all to go to “Parkersburg west virginia’s humane society. That would be great. I give them a few bucks when I can. Awesome!! Like always inspiring Thank you for sharing. St Jude’s is my top choice. One of my favorite charities is THE SCRATCHING POST in Cincinnati, OH. They are a no-kill cat shelter and I got my black kitty, Hal, from there. I just bought your Bible journaling 101 class. What a wonderful series of classes on this subject. I just bought my Bible and I’m new to this beautiful art, and wonderful way of communicating with our Savior. So I need all the help I could find. I don’t need help on knowing God because I’m in a close relationship with Him. I needed help on what not to use, and which works best in my journaling, painting, use of markers, and so on. This class was awesome because you answered most of my questions. But I do have one more question. You talked about the gesso and not useing it in your Bible, but what about the acrylic clear glaze extender products that I have seen used in some videos. Does it work? Does it dry any quicker? Your thoughts? Ok I guess that’s 4 questions. Sorry, like I said, I can use all the help I can find. Thank you so much and have a blessed Sunday, and all the rest of Gods days. Your work always inspires me, Sandy. Thanks always for paying it forward. My favorite charity is Peaceable Kingdom animal shelter in Allentown, PA.
Tacoma Youth for Christ! Because they deal with hurting children who need foster care and adoption and this issue has touched my family personally! Thanks, Sandy! Love be your work always. My favorite charity is Hearts in Motion, or HIM. They are based in Indiana and my husband has been volunteering for them once a week at least. It was started by one woman and has grown tremendously so my husband has been helping to apply his corporate business skills to help them grow and get grants and other such funding for their mission. Their mission began to go to Guatamala to do medical mission trips to repair cleft pallets, but has grown to other medical missions. Because cleft pallets are caused by nutritional deficiencies she started a nutrition center then an orphanage. Mission trips help build churches and wells and whatever villages need. They lead multiple mission trips to the area every year with doctors and nurses, college students, families of volunteers, church groups and whoever is interested. Most find it a life- changing rewarding experience. You should go on one of their trips!! Very happy to learn this technique. It brings such dimension to cards. Northshore Animal League. They are building a free range kitty pavilion! More lovely work, Sandy. Your last post always seems to be my favorite but I will choose the fairies with a touch of winter. I would also like the wounded warrior project, if selected. Thank you for continuing to amaze and educate. Thanks for another great tutorial! My charity of choice is Black Mountain Home for Children, Youth and Families. My favourite charity is the Hospital for Sick Children Toronto. They have a clinic that councils moms on medication during pregnancy and breastfeeding. It’s been invaluable to me since I have a chronic disease but still wanted to have children. I now have three healthy kids thanks to them! Wow!! 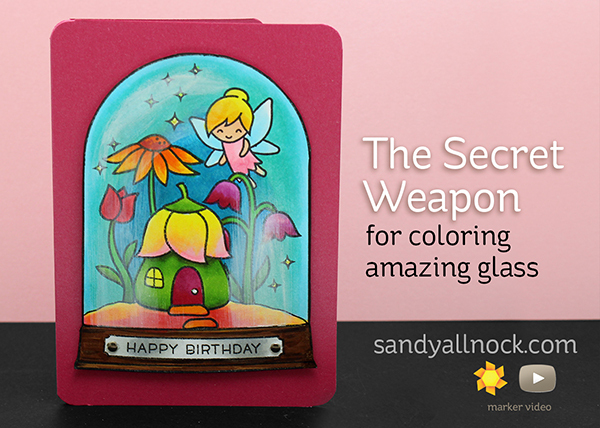 Love this “secret weapon” idea soo much!! Beautiful work as always!! My favorite charity is the Lewy Body Dementia Association! Oh man. You’re right – it might give me a mini heart attack to take paint to a beautiful image like that. Love the coloring on the Fair jar, too! How do you pick ONE favorite charity? Kids Alive International is on my top few list. Got the opportunity to go to Zambia a couple years ago and work with one of their facilities to help with some basic medical needs. They run schools and orphanages in a bunch of different countries. What an ingenious technique. It’s so fun and brings things to life! My favorite charity is Operation Christmas Child because of the eternal end results. WOW, great video and tips. Thanks Sandy. My fav. charity is the Canadian Cancer Society. Fun video. My favorite charity is the German Shepherd Rescue of Orange County. They are located in Newport, California and they save many dogs each year. Thanks. I am always amazed by your fabulous ideas and the great quality of your tutorials. Thanks for the continuing education and inspiration. Really neat! So many of us have the Ball jar type of stamp – that would be my vote for a video! My charity would be Montana de Luz – an Ohio based org that runs an orphanage in Honduras for children with HIV. What a great idea!!! Best Friends Animal Sanctuary is near and dear to my heart. Thanks for providing so much inspiration and sharing your knowledge. Your cards are awesome. When you were talking about the trepidation of painting over the scene after spending lots of time coloring, I was holding my breath. It all came out beautifully but without seeing the demo I don’t think I would have taken the chance. Thank you for “taking the plunge” for me. My charity would be wounded warriors. Thank you so much for your generosity. Spring Farm Cares or American Red Cross. Gracious idea!